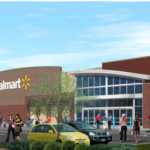 Ladysmith Crossing is a proposed Walmart-anchored regional retail development on Ladysmith Road and Interstate 95 in Caroline County. In addition to the 150,000 square foot Walmart, Blackwood Development Company plans to develop an additional 100,000 square feet of retail and service space. In addition to Walmart, there be at least one other anchor tenant as well as small shop tenants that typically follow Walmart. The store, which is a $25 million investment that will create about 300 jobs, is set to open in 2017.